Tooth decay and gum disease are talked about often in the dentist’s office – but what about oral cancer? This serious condition affects tens of thousands of patients each year, and many cases aren’t identified until they’ve already reached advanced stages. While oral cancer is very rare in children (the major risk factors are tobacco and alcohol use, which they don’t participate in), related health problems and genetic predispositions do make it a possibility. That’s why Dr. Danielle wants her patients and their parents to be aware of the warning signs! Sores on the lips and/or in the mouth that are slow to heal or bleed very easily. Red or white skin patches in the mouth. Lumpy or swollen areas in the mouth, neck, or jaw. Throat pain and/or excessive difficulty with swallowing. 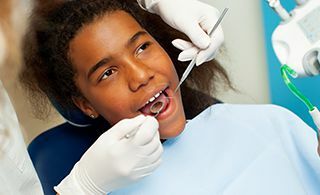 At Pediatric Dentistry of Prospect, Dr. Danielle and the rest of our team work hard to help your child stay safe, secure, and smiling brightly when it comes to their oral health. That’s why we provide oral cancer screenings as a vital part of every pediatric checkup. Contact us today to schedule a first visit!